Numero Uno Web Solutions (NumeroUnoWeb.com), a fast-growing Internet marketing firm that caters to medium- and large-sized business-to-business (B2B) and business-to-consumer (B2C) companies, is weighing in on a recent report showing Canadian engagement with mobile shopping is increasing, opening up new e-commerce opportunities for both traditional brick-and-mortar stores and online brands. Libarian explains that a strong online presence has a positive impact on overall buying patterns. According to the report, Canadian businesses with both online and offline sales made almost one-quarter of their sales from Internet transactions. On top of that, many in-store purchases made by Canadians were researched online beforehand. The study also found that while 91.4% of large businesses have web sites, only 42.3% of small businesses in Canada currently have one. One of the primary benefits of having an online presence is that small businesses can compete with large businesses on a level playing field. That’s because search engines like Google and Yahoo! rank sites based on algorithms: search engines take hundreds of factors into consideration, including web layout, keywords, quality of content, relevancy, grammar, and backlinks. Numero Uno Web Solutions, is one of the top Internet marketing firms due to constant innovation and overall customer satisfaction. 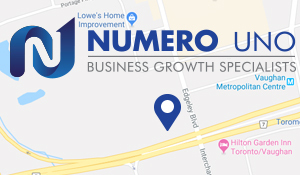 For more information on Numero Uno Web Solutions and to discover how the company can help maximize a business’ search engine optimization and online presence, visit NumeroUnoWeb.com or call Numero Uno Web Solutions toll-free at 1-855-SEO-XPRT (1-855-736-9778).